Every morning when I arrive at work I take an elevator up 4-5 flights from the parking garage and then another elevator up an additional 20 floors to get to my office. My trips up and down the elevators have taught me a couple lessons about "elevator etiquette." Most of these are really pet peeves but I think if these rules were enacted in elevators across the US we would all have some more enjoyable elevator rides. Speaking of breath, don't step onto a full elevator right after you smoke. FYI, you don't smell good and for all the non-smokers sharing this ride with you, we don't appreciate it. 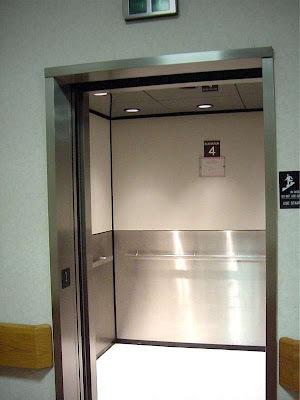 Unless you're pregnant, on crutches, or otherwise physically incapable of walking up and down a flight of stairs, please don't make the elevator stop so that you can take it only one floor. You're in a moving box with no cell-phone reception. Please don't repeatedly scream into your phone that you can't hear the person on the other end or that the signal is breaking up, just wait a moment and finish your call before getting on the elevator. Please be courteous of those who have been waiting longer than you, they get to get on the elevator first. If you have a small child or if you are immature, please do not hit all the buttons and make the rest of the passengers stop on every floor. If the elevator is full and several people get off at one time please feel free to move into the empty space instead of standing so uncomfortably close to the person next to you. Since I follow the same elevator etiquette, please be kind and hold the doors for me and other fellow elevator riders when you see us approaching. There's nothing quite as frustrating as watching a nearly-empty elevator close its doors on you. I think the main point is really that we all need to be more cognizant of the other people around us, whether it's on the elevator, in traffic, or in line at the grocery store. I know I can't be the only one that has elevator pet peeves, is there anything that I missed? When you are waiting for an elevator, don't stand directly in front of the doors and refuse to move when the doors open so that people can't get off without running over you.